ETR 500 was the first Italian high-speed train. Image courtesy of Beta16. ETR 500 is manufactured by TREVI, a consortium of Alstom, Bombardier and AnsaldoBreda. ETR 500 is currently operated by Trenitalia on Rete Ferroviaria Italiana (RFI) tracks. Image courtesy of Jollyroger. ETR 500 can be operated at a speed of 300kmph. Image courtesy of Pil56. ETR 500 runs on a power output of 8,800kW. Seating on the ETR 500 trains. Elettro Treno Rapido 500 (ETR 500) is a high-speed electric multiple unit, which has been in operation in Italy since 1993. It is manufactured by TREno Veloce Italiano (TREVI), a consortium of Alstom, Bombardier and AnsaldoBreda. Design of the train is based on the specifications of Ferrovie dello Stato Italiane (FS) and is currently being operated by Trenitalia on Rete Ferroviaria Italiana (RFI) tracks. FS put forward the idea of building a completely new high-speed rail network in Italy in 1985. The network was planned to be serviced by trains with operational speeds of around 300kmph. Tilting trains, popular during that time, were not an option as they could not be operated at such high speeds. Therefore, the idea for developing a new train was proposed. The TREVI consortium was formed under the supervision of FS. "ETR 500, which was manufactured in Vado Ligure and nicknamed Remo, became the first Italian high-speed train." ETR 500, which was manufactured in Vado Ligure and nicknamed Remo, became the first Italian high-speed train. The first prototype called ETR 500-X was designed in 1988. The train reached a maximum speed of 319kmph during test runs. Another two complete trains based on the prototype were put into trial operations in 1990, they were named ETR 500-Y and nicknamed Romolo. Following the successful trial operations of the two prototypes, FS placed an order for 30 mono-current train sets. The trains were capable of running on traditional line voltage of 3kV DC, but were drawing large amounts of energy when running at speeds of 350kmph. The maximum speed of the trains was, therefore, fixed at 250kmph. Automotrice Grande Vitesse (AGV) is an advanced very high speed train designed and developed by Alstom. It is claimed to be the most economical and eco-friendly railcar in the world. A second generation of train sets was designed to overcome this problem. These trains run at 25kV 50Hz AC power, which allows operation at speeds up to 300kmph. The new generation trains were named Politensione and were built with the flexibility to run at 3kV DC. ETR 500 has different versions depending on the location of operation and refurbishment of the vehicle. ETR 500F is a tri-current version that can run at 1.5kV and is used on mainstream lines in southern France. ETR 500 Y1 and Y2 were prototypes, while ETR 500P is the multi-current variant of the second generation of the train set. 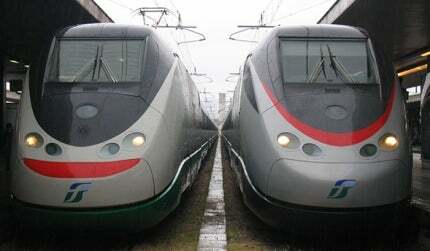 The trains were employed on the Rome-Naples and Torino-Novara high-speed lines from 2005-2006. ETR 500 AV (Alta Velocita) was the internally and externally refurbished train set that went into operation in 2005. They were introduced by Trenitalia on a new high-speed service programme along with Eurostar Italia. The ETR 500 Frecciarossa trains, which can can travel at top speeds of 300kmph to 350kmph, were introduced in 2008 by Trenitalia. The ETR 500 was designed to become a next generation high-speed train with its infrastructure and characteristics matching the comforts of a high-speed train. The train was designed by an Italian car design firm Pininfarina. Designing the first high-speed train during the time presented various challenges for Pininfarina. The design was based on extensive research carried out to build a highly technological, stylistic and aerodynamic prototype. The research mainly focused on the designing of a structure with a low drag coefficient. "The ETR 500 Frecciarossa trains, which can can travel at top speeds of 300kmph to 350kmph, were introduced in 2008 by Trenitalia." The outlining of the matrix was supervised in its tiniest detail limiting the aerodynamic resistance while moving at high speeds. The high pressures on the front doors and lags on the side doors were optimally minimised. Special measurement techniques were adopted for the design, including a computer controlled traversing gear and a 14 bore probe that measures speed and pressure produced due to aerodynamics. Different locomotive shapes were tested based on these results. The result was a thoroughly capable locomotive meeting all the operational requirements and a 700 passenger capacity. The trains run on a 1435mm gauge with a power output of 8,800kW. Pininfarina was the chief designer of the locomotive, while ABB group was awarded a contract worth $19m by Bombardier Transportation to design and manufacture 110 traction transformers for use in the ETR 500.